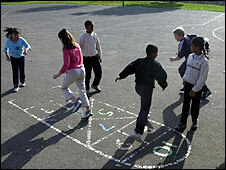 Traditional "rough and tumble" schoolyard game British Bulldog declined in use as schools feared injuries and lawsuits. But in a backlash against a risk-averse culture, is it about to make a comeback? It was a playtime scene acted out over generations. A headlong charge towards your mates, a quick shimmy to evade their grasp and a breathless sprint for the "safety" of the other side of the yard. For decades, British Bulldog was a favourite among schoolchildren who bore the victory scars of scabby knees and torn trousers. But recently the fear of more serious injury - coupled with an increasingly litigious public - prompted many schools to ban the game altogether. While there are many variations, the game generally involves "bulldogs" trying to prevent runners from getting past them to the other side of the playground. Once caught, held or "tagged", the runner becomes a bulldog and the winner is the last runner left. 1: One bulldog (or maybe two) stands in the middle of the pitch, with the runners lined up on one side. 2: The runners try to get to the "home" area of the other side of the pitch without being caught. If the bulldog holds a runner for long enough to say "British Bulldog, one, two, three", then that runner becomes a bulldog. 3: The runners try to evade two bulldogs running back again. A recent survey of 1,000 children by the Lottery-funded National Children's Bureau revealed a third of them had been banned from playing the game because it was too dangerous. Now the Local Government Association, which represents councils in England and Wales, says parents and teachers should defy the compensation culture and encourage children to get stuck into traditional playground games to combat obesity. It named British Bulldog, alongside "stuck in the mud", tag and hopscotch, as games it would like to return. This has been greeted with delight by members of the Campaign Against Political Correctness, although they fear safety rules could leave a watered down version of the game. It says the name would have to be less patriotic and aggressive to suit modern tastes and maybe "International Poodles" would be more appropriate. And children would have to wear full protective body gear, including knee pads, helmets and gum shields. The campaign's co-founder Laura Midgley said banning British Bulldog was typical of the "misguided mollycoddling" of youngsters. "Today's children get dropped off at school in cars because parents want to keep them safe," she said. "But how many children die in cars compared to the playground? "You just can't rule out risk altogether and we shouldn't be wrapping children in cotton wool." Accidents are inevitable and people have to understand that children will fall over and get hurt, says Mrs Midgley, who is also a school governor. One long-serving Lancashire primary school headteacher, who asked not to be named, says health and safety rules passed down from central government have forced him to ban many traditional activities, including conkers. "It's ridiculous. Kids could do things 15 years ago that we wouldn't dream of letting them do now. If it's slightly wet, we don't let them go on the grass in case they fall and we get sued. But kids need to run off their energy. Despite teachers' complaints, the Health and Safety Executive insists there is little evidence of school staff being sued and says prosecutions are also rare. "We are not concerned with children playing games," says a spokesman. "We don't stop people having fun, we try to stop people getting into situations where they die." The spokesman said if schools sensibly managed the risks involved in children's play, they would not be at risk of prosecution, and rough play was a disciplinary issue, not a health and safety one. There has never been a nationwide ban on British Bulldog, says a spokesman for the Department for Children, Schools and Families. In June 1985, the British Medical Journal reported how a 13-year-old boy injured his spine during a game. "His neck was flexed forcibly while his head was against the floor, and immediately after the injury he had severe pain of the cervical spine," it read. It went on to say that although the boy was not paralysed, "this case... shows that games such as British bulldog can be as dangerous as rugby football". Edward Bainbridge knows its perils better than most. Five years ago, his 11-year-old son Charles suffered two broken arms when he was pushed to the ground by an older boy at Caerleon Comprehensive School in Gwent, south Wales. Now 16, Charles is a keen rugby player and not the sort of pupil to be pushed around but still suffers problems where the bones were broken above his wrists. Despite this, Mr Bainbridge, 59, said it is important to "let boys be boys". "I used to play British Bulldog when I was in the Scouts 40-odd years ago," says the retired barrister and cub scout group leader. "Kids are hardly allowed to sneeze these days and that's a bad thing. Boys have got to be able to climb trees. They will fall a few times, realise how hard the ground is and be more careful next time." Rather than banning traditional games, schools should concentrate on ensuring there is adequate supervision of play, he added. I spent some time teaching at a primary school in Nepal earlier this year. I taught British Bulldogs to a couple of classes, they loved it. It was by far the most popular game I showed them (they didn't really take to stuck in the mud). The first game resulted in a few grazed knees and a little fight between a couple of boys but happily Nepal doesn't the same over the top health and safety rules and the other teacher thought it was great too. Having a low centre of gravity certainly helped when playing Bulldog. I had one or two moves up my sleeve too and frequently found myself the last man standing. I don't recall anyone being seriously hurt though. The people most in peril were other, non-playing kids (or 'traffic' as we called them). To be honest, the worst thing was getting scratched to death when the girls joined in. We used to play bulldog at primary school two years ago. The only reason it was banned is because people used to walk through the game and get knocked over by the running people. We didn't play it so that you have to push them t the ground or hold onto them we would simply tap them and that was it. The only time people got hurt is when they walked through the middle of a game (literally) or getting tripped up over other peoples legs. I don't think the game should be banned but a safer version (our old version) should be played instead. I used to play this game when i was a youngster, it never seemed that rough, and now im still only 16, it shows how much has changed in such a short amount of time. We used to play British Bulldogs at our mixed youth club, on the church green. In our version the runner had to be held off the ground for the count. The struggles were tremendous but there was never anything worse than a few bruises and the odd black eye (mine usually - I was a bit of a scrapper). We were all banned from playing British Bulldog at my school in the 80s when a friend was tackled, fell on a bag, and ended up with a Thundercat stuck in his head. His Mum never sued though. I used to play British Bulldog as a scout. No-one got hurt and it was good fun. We really have lost the plot. I watched a kids programme with my daughter the other where custard pies were being thrown and everyone was wearing safety goggle. CUSTARD PIES!!! The sooner kids are allowed to play games that introduce a bit of risk and danger the better. At the moment they either have no understanding of what can be dangerous or they are paralysed with fear and wont try anything. Health and Safety professionals have never tried to ban any form of playground activity. The insurers are to blame along with lawyers and greedy parents. This is a litigation issue and should not be blamed on health and safety professionals who work tirelessly to prevent serious accidents through sensible risk management.